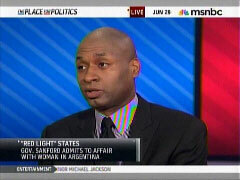 "This is just another sign of the growing incivility and really vulgarity of our modern American politics in campaigns. These campaigns have gotten so ugly and so nasty, that they're now tarnishing the whole system....I can never recall a President stepping off Air Force One, which is itself a symbol of the presidency in American democracy, and being subjected to such public rudeness. I think really we're a better people than this little incident illustrates." — Bob Schieffer on the January 26 CBS Evening News, talking about the picture of Arizona Governor Jan Brewer pointing a finger at President Obama. "The fact is, when I see that still, I cannot help but to be reminded of the still photograph that was captured in 1957 in Little Rock, Arkansas, of the young woman Hazel screaming at a young Elizabeth Eckford on her way trying to get into Little Rock High School, Central High School in Little Rock, Arkansas....That image captured all of the ugliness, all of the nastiness of the larger political milieu, and I feel that this picture [of Governor Brewer and President Obama] does as well." — Newly-hired MSNBC weekend anchor Melissa Harris-Perry on The Last Word with Lawrence O'Donnell, January 26. "Finger pointing — that photo everybody was talking about today. Who have you ever seen talking to the President like this?...The governor of Arizona with her finger in the face of the President of the United States. You don't see that often or maybe ever...."
— Brian Williams on NBC Nightly News, January 26. 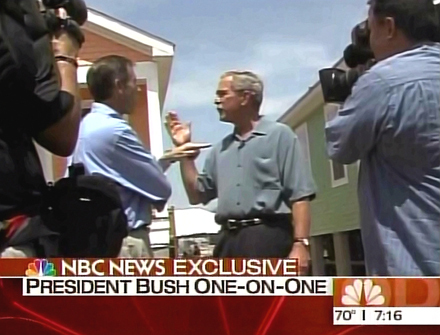 Interviewing George W. Bush back in August 2006, Williams jabbed his index finger in the President's direction. "Any viewer watching this, despite personal prejudices pro or con or partisan differences, would look at this speech and it would be very hard to say that he is apologizing for America. This was resoundingly positive and optimistic in every way...."
— NBC's Andrea Mitchell disputing Mitt Romney's characterization of Obama's speech, live coverage January 24. "His speech was equivalent to Ronald Reagan's 'Morning in America' speech, which was a positive outlook on the world and I think that Republicans can embrace him because of Ronald Reagan. It is very similar to that. It's positive, it's optimistic. He actually believes that they're gonna cooperate with him....From his mouth to God's ears, they should start cooperating and get this country going and stop this gridlock because it's not patriotic!" NBC's David Gregory: "We know that Mitt Romney, if he is the nominee, is going to be the foil for people who are, you know, working the system in a way that the President thinks is unfair." NBC's Andrea Mitchell: "And especially his [President Obama's] mention of the Buffett Rule, proposing that millionaires lose deductions and that there be a minimum tax of 30 percent, we're told is the detail on millionaires, that in such exquisite contrast with today being the day that Mitt Romney finally, under pressure for weeks and weeks by Republicans, by the media, by others, finally did release his tax returns." — NBC's live coverage following the State of the Union, January 24. "Debbie Bosanek says she still feels like Cinderella at the ball, given the 24 hours that she's had....A whirlwind ride to stardom, that began when her famous boss, Warren Buffett, says she pays a lower tax rate than he does....It comes just 24 hours after Republican candidate Mitt Romney revealed he made almost $43 million over two years, paying a tax rate of 13.9 percent in 2010. Not Debbie's 35.8 percent." 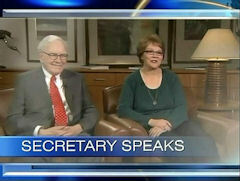 — ABC's Bianna Golodryga profiling Buffett's secretary on World News, January 25, the day after Bosanek was seated with First Lady Michelle Obama during the State of the Union to illustrate the President's pitch for higher taxes. 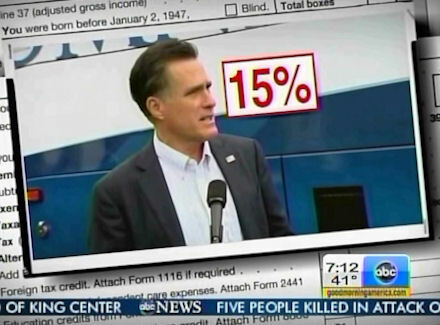 False Narrative #1: Romney's Tax Rate "Less than Many Middle Class Americans"
"Mitt Romney actually released his taxes, and we found out not only did he make $21 million last year, but a total of more than $42 million over the course of two years. And his tax rate was under 14 percent, adding fuel to the fire that the incredibly affluent, the rich folks, pay taxes at a lower rate than the average person." — CNN Newsroom anchor Brooke Baldwin, January 25. "Romney revealed he pays a lower tax rate than many middle income Americans.... How did Romney get away with paying so little?" — Jonathan Karl on ABC's Good Morning America, January 18. "Romney appeared to be knocked off message, promising to share his returns in April and also disclosing that he pays 15 percent in income tax, like many wealthy Americans, but less than many middle class Americans." — NBC's Peter Alexander on Today, January 18. An analysis of data presented by the left-leaning Tax Policy Center shows virtually all income tax filers (95.48 percent) with an adjusted gross income of less than $200,000 paid an effective income tax rate of under 15 percent. 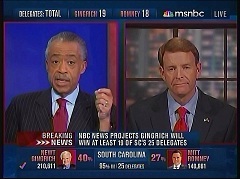 — MSNBC host Al Sharpton during his network's live coverage of the South Carolina primary, January 21. 'When you say that this President is the President who is the 'food stamp President,' and if you actually look at those numbers, it was George Bush who was the food stamp President." — Anchor Soledad O'Brien on CNN's Starting Point, January 19. "Gingrich lies repeatedly. First of all, we know today that more people were collecting food stamps under George W. Bush than are under President Obama. So, that's the first — something like a difference of about a half a million people." — MSNBC host Martin Bashir on The Ed Show, January 23. In fact, the latest statistics from the U.S. Department of Agriculture (as of November 2011) show 46.13 million Americans on food stamps, a figure 40 percent greater than the highest number of recipients recorded during the Bush years (31.98 million, in January 2009). GOP Attacks on Obama — It's All Racism, Right? "Newt Gingrich said it's time to confront the truth about President Obama. He said that the President 'will always prefer a food stamp economy to a paycheck economy and call it fair. '...Do you think he's playing racial politics when he calls President Obama a food stamp President?" 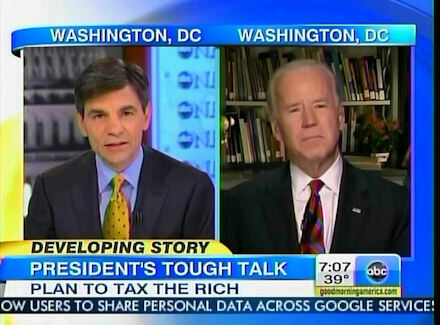 — George Stephanpoulos to Vice President Biden on Good Morning America, Jan. 25. Keeping an Eye on the Conservative "Cracker Counties"
"[North Florida] is going to give us a sense of what's ahead in March, when this primary does move to the deep South states, because as you know, Chuck, a lot of the counties in the panhandle, in north Florida, the cracker counties, if you will, more resemble Georgia and Alabama than they do Florida." CNN Anchor Claims Vast "Suffering Under the Reagan Era"
"I remember Reagan, I was kind of a young person at the time. And it's almost like revisionist history here. Back in the day, there were a lot of people who were suffering under the Reagan era. Some people believe that this is now rewriting the history books, if you will..."
— CNN Newsroom anchor Suzanne Malveaux, January 27, talking about the Republican candidates seeking to associate themselves with Reagan's legacy. 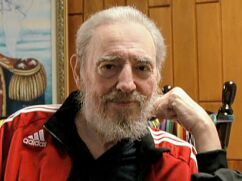 Times Tickled by "Retired Cuban Leader's" Slam of GOP's "Idiocy"
"As the Republicans appealed for votes among Cuban-Americans and other Hispanics, one person who said he was not enamored of the field expressed his distaste: Fidel Castro, the retired Cuban leader whose 1959 takeover prompted the exodus of Cubans to South Florida. 'The selection of a Republican candidate for the presidency of this globalized and expansive empire is — and I mean this seriously — the greatest competition of idiocy and ignorance that has ever been,' he wrote in an opinion piece in state-owned news media." — New York Times correspondents Michael Shear and Trip Gabriel in a January 26 news story. "When Marxists are complaining that your party's candidates are disconnected from today's global realities, it's generally not a good sign. But they're not alone." — New York Times columnist Tom Friedman, January 29, referring to Castro's belittling of the GOP candidates. "Many Republicans are willing to forgive his [Newt Gingrich's] flaws and his past because he connects with a silent slice of their core convictions — their deep-seated, long-simmering issues with an 'elite' media bias, minority 'privilege' and Obama's 'otherness.' Romney dares not go there. Not Newt. He's the street fighter with a history of poisonous politics who not only goes there but dwells there. He makes his nest among the thorns of open animus and coded language." — New York Times columnist Charles Blow, January 21. Campaign Reporters Were Obama Flacks Before, but Not Anymore? "No person with eyes in his head in 2008 could have failed to see the way that soft coverage helped to propel Obama first to the Democratic nomination and then into the White House. But in the course of the past three years, reporters, as is their wont, have arrived at a more measured (and even jaundiced) view of him. Let's hope that means that in this fall's horse race, both ponies get ridden equally hard." — New York Magazine political reporter John Heilemann, January 27.